In 2004 I took a job as the (i.e. only) English-speaking press officer at the Ecole Polytechnique Fédérale de Lausanne, in Switzerland. Soon I was reading, speaking, thinking and dreaming in French. From there it was just a baby step to translating things from French into English. I’ve been translating for EPFL ever since. The crowning glory of these efforts was their thrice-yearly institutional magazine Reflex, which in 2014 joined a few other European universities and became Technologist. Other clients included the Swiss watchmaking company Audemars Piguet, the America’s Cup yacht Alinghi, and the Bolo Museum. Here’s what some of them have to say about working with me. In 2015, I translated a book, Comment se comporter face aux extraterrestres? by Philippe Barraud. 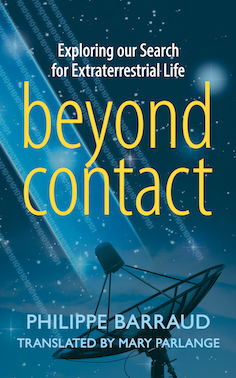 The English version, Beyond Contact: Exploring our search for extraterrestrial life, is available on Amazon Kindle. The long and short of this? I have zero official credentials as a translator. Instead, I have oodles of experience as a writer of science-related subjects and a mastery of French and English vocabulary. I’m a whiz with online thesauruses and translation resources. And to answer the inevitable question: No, I never translate in the other direction. If you have a science-for-the-public text or book in French, I might just be the right person to translate it into English for you. Send me a shout by filling in this form, and we can start a discussion. Caveat: I never translate legal texts or anything about architecture. Sorry. "Mary is an amazing translator, extremely competent, reliable and fast, with an eye for details." "Grâce à sa connaissance des termes techniques et à sa parfaite maitrise du français, les traductions de Mary Parlange ont été particulièrement appréciées." "Fast and dependable, she is able to render the tiniest and most subtle nuances of French into a vivid, reader–friendly English text. Her scientific background and political sensitivity allow her to take the necessary freedom and distance from the source language, which result in texts sounding truly English native with a engaging tone of her own."